In the twenty-three plus years that I have lived in New York City I have seen a lot of shows. In fact between Broadway, Off-Broadway and yes even Off-Off Broadway I would reckon to guess that I have seen over three hundred shows or more. What can I say? I love the theatre. When they first announced that they were making a musical about Carole King I was intrigued but also a little hesitant. After all for every hit jukebox musical like Jersey Boys and Mamma Mia there are flops like All Shook Up, Ring of Fire and of course the most recent Holla If You Hear Me. Let's face it. Just because the songs are loved doesn't automatically mean that they will be just as popular on the Great White Way. Plus it helps to have a strong story as well. Anyway as you all know by now Beautiful is a hit. Not only that but it continues to gross over a million dollars a week at the box office. Like I said it's a hit. Oh and just in case you are wondering I finally got around to seeing it. Not because I was unsure if I would like it. I knew the music would be good. The truth is tickets were hard to come by. Oh sure I could have spent the big bucks to see it but at the end of the day I figured paying my rent and eating were more important. I'm just kidding. The tickets aren't that expensive. Now having seen several clips of the show including the one on last year's Tony Awards I knew I would probably like it. Like I said I love Carole's music. However Jessie Mueller who won last years Tony Award for Best Actress in a Musical had left the show. Would her replacement be just as good? Well you know what? She was good. In fact I would go as far as to say amazing. The show too. I had the best time and I can guarantee you will too if you see it. It is fantastic. By the way for those of you looking to see it you are in luck. We sell it. Also having sat in the Rear Mezzanine of the Stephen Sondheim Theatre I can honestly tell you that there is not a bad seat in the house. 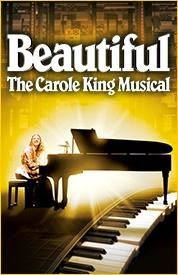 Get your tickets to see Beautiful: The Carole King Musical on Broadway. You will love it. I know I sure did. Until next time theatre fans.